The .408 CheyTac serves as the parent for several other second-generation wildcat cartridges including the .375 (9.5 x 77). By blowing out .408 CheyTac factory cases the wildcatter generally hopes to gain extra muzzle velocity by increasing the case capacity of the factory parent cartridge case by a few percent. 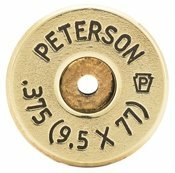 Besides changing the shape and internal volume of the parent cartridge case, wildcatters also can change the original caliber. Because the .408 CheyTac offers a large and sturdy, pressure resistant cartridge case it has become quite popular among wildcatters. For a typical .375 CheyTac chambered gun, shooting 24.30 gram (375 gr) Lost River Ballistic Technologies bullets (claimed G1 BC = 1.02) at 930 m/s (3050 ft/s) muzzle velocity, the supersonic range would be 2230 m (2440 yd) under International Standard Atmosphere sea level conditions (air density ρ = 1.225 kg/m³).